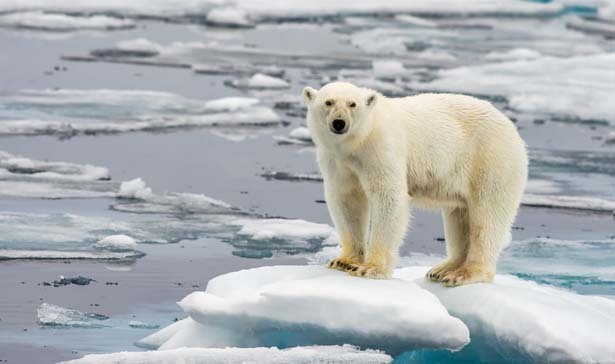 The earth—and everything on it, including this polar bear—hasn't been so close to annihilation since 1984 (Shutterstock). Not since the depths of the Cold War, in 1984, has the Clock been moved so close to the apocalyptic midnight demarcation. Only once in the Clock’s sixty-eight-year history has its threat level been higher—in 1953, following the US’s first explosion of a hydrogen bomb, when it was set at two minutes to midnight. Since its creation in 1947 by scientists who had helped develop the atomic bomb, the Doomsday Clock has become an internationally recognized indicator of humanity’s vulnerability to nuclear destruction. The scientists who advise the Bulletin’s annual evaluation of the Clock, which currently include seventeen Nobel Prize winners, sometimes offer encouraging news. For example, the Clock was moved back to twelve minutes before midnight in 1972 after the United States and the Soviet Union signed the Anti-Ballistic Missiles and the Strategic Arms Limitations treaties, and to seventeen minutes before midnight in 1991 after the superpowers began making large cuts in their arsenals following the signing of the Strategic Arms Reduction Treaty. Climate change was added to the Bulletin’s calculations in the 2000’s amid growing signs that rising greenhouse gas emissions threatened similarly widespread, if less immediate, damages as nuclear war did. Indeed, the Republican-controlled Senate spent much of the week trying to pass a bill to force the construction of the Keystone XL pipeline—a bill President Obama has vowed to veto—while simultaneously denying that human activities are the main driver of climate change. Democrats tried in vain to attach to the Republicans’ Keystone bill various amendments affirming climate science. Senator Bernie Sanders, an independent from Vermont, sponsored an amendment saying that climate change is real, human-caused and already creating devastating problems in the US and around the world and therefore the United States must transform its energy system away from fossil fuels to energy efficiency and renewable energy sources. The amendment was defeated 56-42, with zero Republican Senators daring to support it. Notwithstanding the progress made in the immediate aftermath of the Cold War, today Russia and the United States are “pretty much on a ‘launch on warning’ posture,” said Benedict, even as the Ukraine conflict and other tensions have increased distrust on both sides. Obama and Russian president Vladimir Putin each have about fifteen minutes after being warned of a potential nuclear attack in which to halt an otherwise automatic response from all three legs of the nuclear weapons triad—bombers, submarines and ground-based missiles—that would unleash approximately 800 warheads against the adversary. “So if there is an accident or a miscommunication—and there have been more than a few in the past—and it isn’t caught in time, the result would be unthinkable,” Benedict concluded.